Is your client’s hair craving moisture? 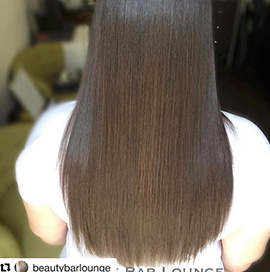 Lasio Mocha Silk Keratin Treatment is a moisture packed formula infused with cacao oil that deposits extreme moisture to revive over-stressed, dry or damaged hair! The Mocha Silk Treatment is our MOISTURIZING formula! It also contains cacao oil, which drenches dry strands in moisture. Mocha Silk is great to recommend to clients with naturally resistant hair, so while it isn’t stronger in terms of formaldehyde content, it is EFFECTIVE at smoothing resistant hair. 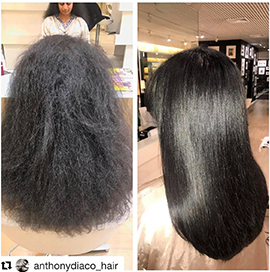 This treatment is excellent for extremely dry or damaged hair, or for those with thick, coarse and very curly hair looking to achieve a straighter look. Cacao oil's smooth texture, enticing aroma, and emollient properties contain natural antioxidants that strengthen and smooth hair. 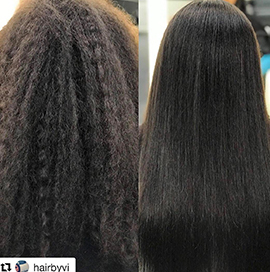 Cacao Oil works to retain moisture and provides a breathable barrier to protect hair that is dry or over-processed against environmental stress and fading. Lasio Keratin Treatments are only available for purchase by licensed cosmetologists and salon owners. It is a product that is for professional use only. If you would like to receive a Lasio Keratin Treatment email customerservice@lasioinc.com and we’ll be happy to send you a list of salons in your area. You can purchase HYPERSILK and our other hair care products on our website by visiting our Shop page or find you can purchase at a salon near you. The best way to know which treatment is right for you is by having a consultation with a Lasio Keratin Specialist as a salon in your area. During your consultation, your stylist will examine your hair and ask questions about your lifestyle and hair goals to be able to make an accurate recommendation. To find a salon in your area please email customerservice@lasioinc.com. When can I wash my hair after receiving a keratin treatment? 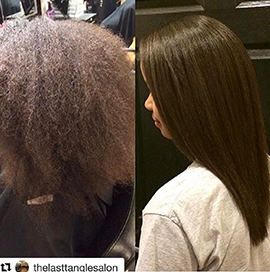 With Lasio Keratin Treatments you have options. You can wash your hair the same day right in the salon, at home that evening, the next morning, or anytime within 24 hours of receiving your treatment. Can I have a color service the same day as a keratin treatment? With Lasio Keratin Treatments you can color your hair the same day as your treatment. Having a treatment performed after your color service will help to lock in your color and rehydrate hair. We highly recommend it. After a keratin treatment how long do I have to wait to color my hair? If color is not performed the same day or before a keratin treatment you must wait two weeks to get a color service. We recommend doing your color first and then your Lasio Keratin Treatment, but if you forget or have roots that need to be covered then waiting two weeks after your treatment is perfectly fine. Why do I have to use sodium chloride free products? It is extremely important to use sodium chloride free hair products after receiving a Lasio Keratin Treatment. Because Lasio Keratin Treatments are water-based, and not silicone based, we require sodium chloride free products not sulfate free. Salt and chlorine will strip the keratin from your hair. We highly recommend using HYPERSILK. © 2018 Manor. All right reserved. Log in or register to access our salon professionals website.